Our family has been on a twisting, turning, terribly hard journey through these years. We’ve been knocked down. Bruised and battered. Those are trigger words, but I use them with care. I mean them for they violence they are. Not to be overly dramatic. As with anybody, these stories are not all for telling in this space, but they have shaped us. They have changed us. It will take four lifetimes to sort through the consequences. This morning I looked out the window into our backyard, and saw my 16-year-old son up in a tree with a tape measure in his hand. Down on the ground his 12-year-old brother stood jotting notes in a notebook. We sold our house in Oregon 6.5 years ago and uprooted our boys for an Alaska Adventure. We left their pup with my parents in Oregon, and we moved north for a job. We lived in transition for a lot of years. And then last November we bought a house with a backyard. Today the boys are out there working on a treehouse. In a kaleidoscope of time, I see them reaching back to their childhood memories when Daddy built a treehouse for them; at the same time, they are stepping forward to apply their own growing-up building skills. As I watched them work today I saw dark clouds threatening at all the edges of our sky. A windy rainstorm was predicted for the afternoon. 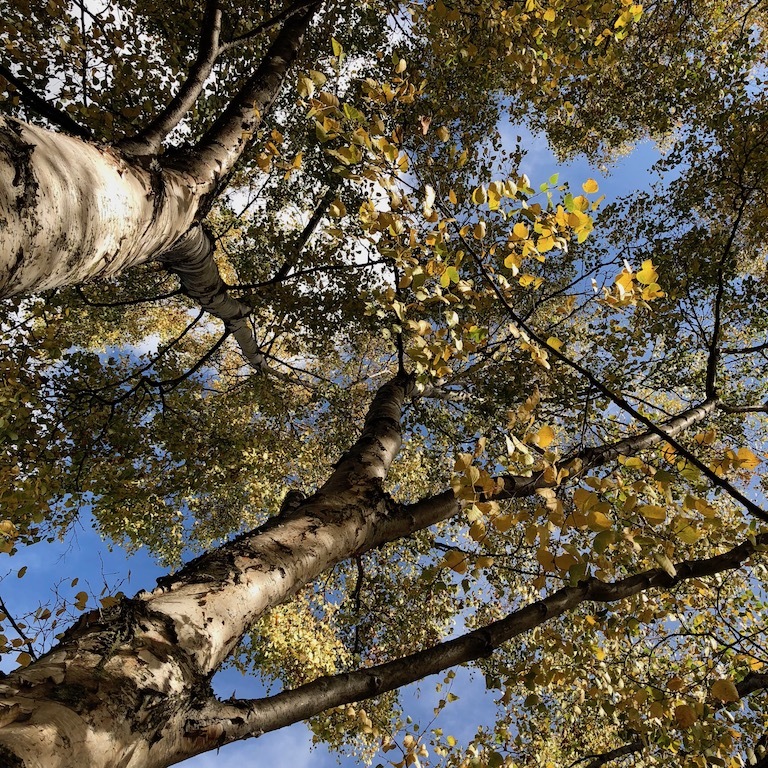 But in that moment, sunlight streamed through the yellow-gold leaves of the gorgeous Paper Birch tree, standing tall and broad in our backyard. At the base of the tree, our 7-year-old golden dog, (who moved up this summer to live with us at last) snuffled in the leaves at the base of the tree. My boys measured and schemed. And it was so very good. I’m pressing up against the rail, pressing up against the rail….